I'm new to Kayak fishing. I’ve long fished from my bass fishing boat, in the photo below, on the many great Corp of Engineer impoundments found across my home state of Tennessee. I’ve also fished from a Jon boat on state park lakes and canoes while drifting from hole to hole on the state’s many rivers and creeks. However, there seemed always to be promising water out of reach even when using these small fishing boats. Either because I couldn’t get my bass boat or Jon boat to a promising body of water (no access road or launch ramp) or, when on a lake, was unable to get an 18.5' Triton far enough into great looking habitat in the back of a creek or on skinny water flats. Today, kayak fishing provides a new way to experience bass fishing that is enjoyable, readily available, inexpensive and infinitely adaptable as a fishing platform. The initial cost is low and expenditures for utilizing and maintaining a kayak are within most anyone’s budget. 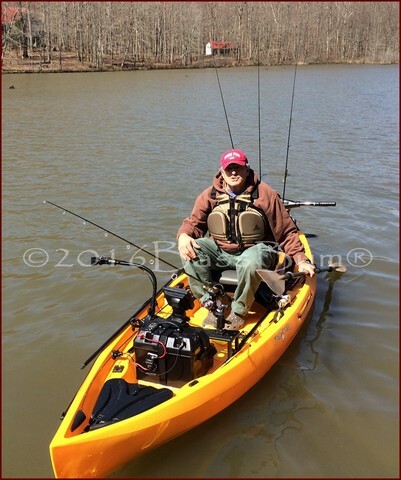 Today, kayaks provide a new way to experience bass fishing that is enjoyable, readily available, inexpensive and infinitely adaptable as a fishing platform. The initial cost is low and expenditures for utilizing and maintaining a kayak are within most anyone’s budget. 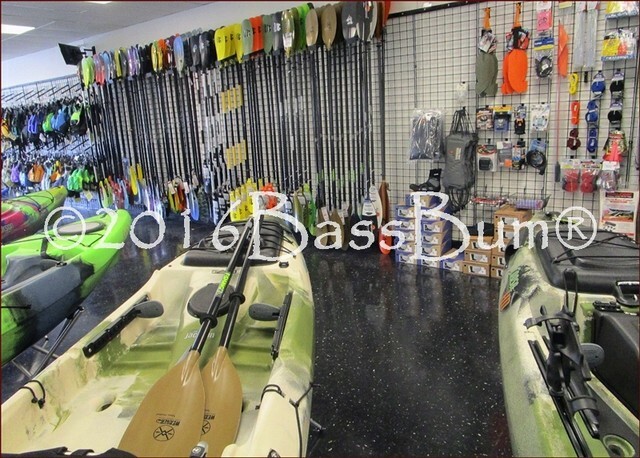 These kayak boats offer bass fisherman new adventures hunting and catching bass with access and stealth not reachable before. For all these reasons I too have added this rapidly growing method of bass fishing to my never ending quest for lunker bass. Note I said added. I still fish from my Triton as well. 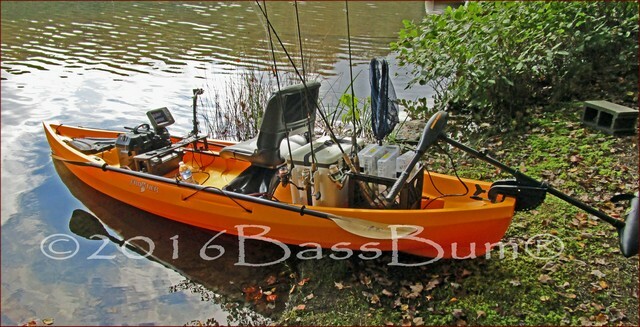 My kayak fishing boat of choice is the Nucanoe in the photo above. A fishing platform that fits my needs well. Stable, wide and perfect for this old fat guy. Before We Get Started, How About Some Interesting Kayak Fishing Stats? 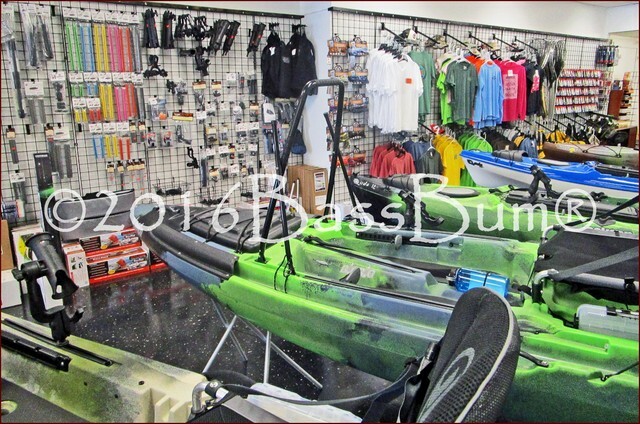 A kayak was the fishing platform used in 3.6% of all fishing trips 2013, 4.3% in 2014 and 3.9% in 2015. Don’t sniff at that. We’re talking 38-40 million trips annually. Take these for what you want. There are always details behind statistics that more specifically explain the meaning of the numbers. One thing not in doubt, the sport is growing! 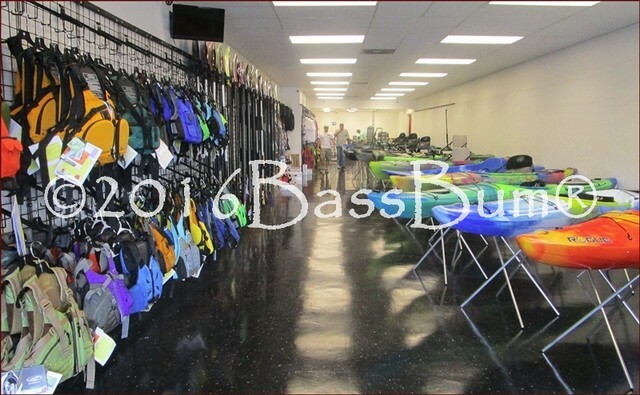 First, kayak fishing boats, those most often used for freshwater bass fishing, are made of durable, low-maintenance rotomolded polyethylene. This makes them inexpensive, widely available for a few hundred to a couple of thousand dollars. 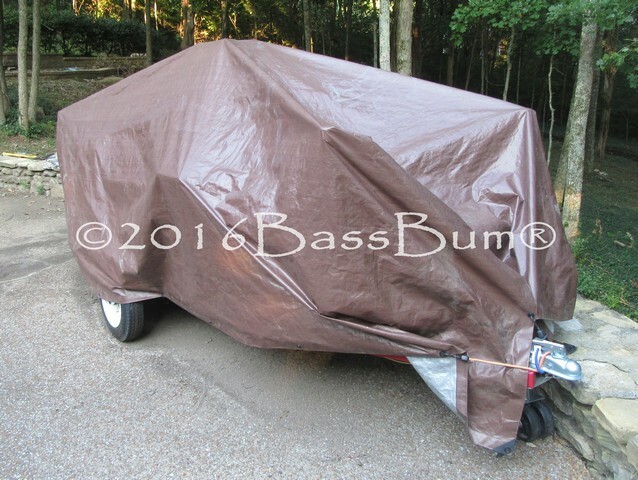 They are readily modifiable and adaptable to meet a bass fisherman's personal preferences. If you're a piddler and tweaker you'll love them. Personal customization goes hand in hand with owning a kayak. This will be determined primarily by where and when you usually fish and if you prefer to stand when fishing or like sitting better. Of course, your physical size plays a huge part in deciding on a kayak design. In the South, a sit-on-top (SOT) works well but if you live in colder climes consideration should be given to a sit-inside (SI) style. The latter may help you stay drier and keep the lower half of your body protected from the ravishes of cold wind and water. 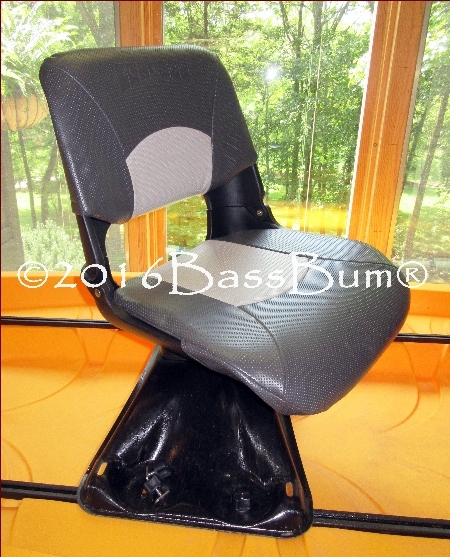 I’m a big guy, 6’ 3”, 234 pounds, so my preference is the wide (41” wide Nucanoe Frontier), sit-on-top design. They’re easier to get in and out of and a wider width is more difficult to flip. You have much more ability to move around with a SOT while a SI is a bit like sitting in a coffee cup, tight! Fast water calls for a flat bottomed, moderately slim design conducive to nimble maneuverability. Big water, still water calls for a little wider, longer model with a v-shaped hull. These features allow for better tracking and easier paddling. Lakes and ponds, even wider rivers that may have slow current, are better fished in long, wide kayaks. 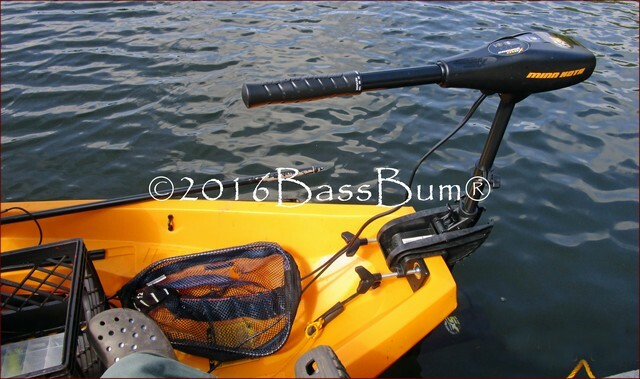 Though many traditionalists consider it blasphemy, fishing kayaks often accommodate trolling motors. When fishing alone there is a lot to be said for being able to drift downstream fishing and then being able to motor back to you launch point. Don’t get hemmed in by traditionalist thinking. Decide for yourself. Arguably a most important kayak feature is a comfortable seat. Spend a full day, or even a few hours, in a seat that strains your lower back dampens what might otherwise be a very enjoyable experience. There are many choices available and your choice will ultimately be determined by personal preference. I have a fully cushioned seat as you see in the picture. It also swivels 360 ° which contributes greatly to movement and reduced back strain. I’m still evaluating whether a fully cushioned seat is best. More on that in the kayak seating article. Where are you going to keep it? Outside covered, inside on a rack or hoist? Available space obviously dictates here. This picture, not pretty I know, but functional, shows my choice though there are many methods available. Loading and transporting are considerations to which you should give extensive thought. Most think strapping it on the roof of a vehicle is the obvious way to transport a kayak and there are many roof racks available. Do not underestimate the difficulty of lifting a kayak that weighs 50-85 pounds to the top of a car. The weight and length of the kayak measured against the height of your vehicle’s roof is critical. Doing this alone is less than fun and can cause injury. 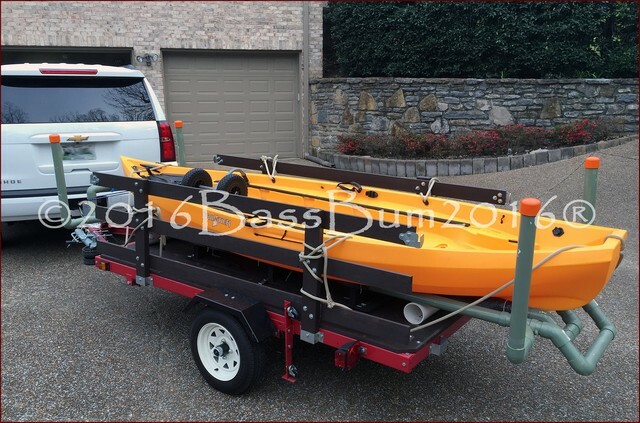 Trailering is a good choice for a fishing kayak, as they tend to be a bit bigger and heavier than recreational kayaks. You can get a commercially made kayak trailer or make your own, as many do. The picture above is a kayak trailer I made from a Harbor Freight trailer kit and PVC, and I’m not a particularly handy guy. Of course, if you have a pickup truck you’re set. Paddling is the traditional kayak fishing method of propulsion. Good exercise for sure but as a day gets longer and the distance back to the car grows ever greater the idea of paddling all the way back to the put-in loses its appeal as a muscle building or calorie burning exercise, at least for me. A trolling motor, or a small 2.5 hp gas motor, not only reduces the amount of energy expended paddling, but, by adding speed it also expands the amount of water you can fish in a day. Additionally, if you suffer some emergency far from where you launched or some incident inhibits your ability to paddle, a motor will shorten the time and energy needed to get to help. You Bought It - Time to Customize! Price is a major consideration for most of us. While kayaks range from a few hundred dollars to over $3,000, the medium price range for a new kayak is probably $700-$1,200. Used kayaks can be found for very reasonable prices but remember, kayaks do hold their value pretty well so you might do well just to buy a new one. An area where you can run up your bill is in rigging your kayak. This can be done piecemeal or all at once. Really depends on available funding. But it is definitely a fun process. Once you have purchased your kayak the real fun of kayak fishing begins, rigging the sucker. Here are things you may need, some you won’t but will find nice to have. These and many others will be covered in detail in other articles. The picture at right is day one of my kayak adventure. 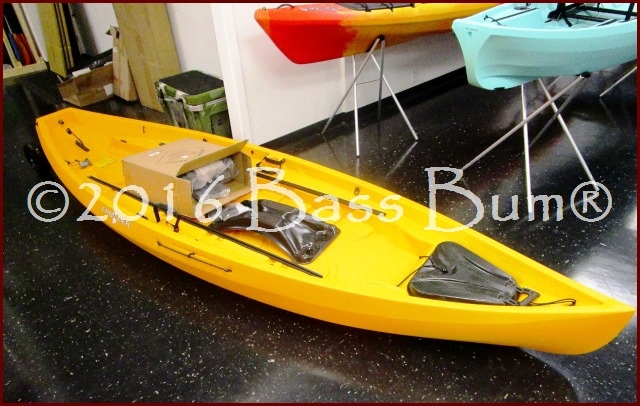 My 12' Nucanoe Frontier kayak on the floor of Caney Fork Outdoors before loading it on top of the car for the trip home. 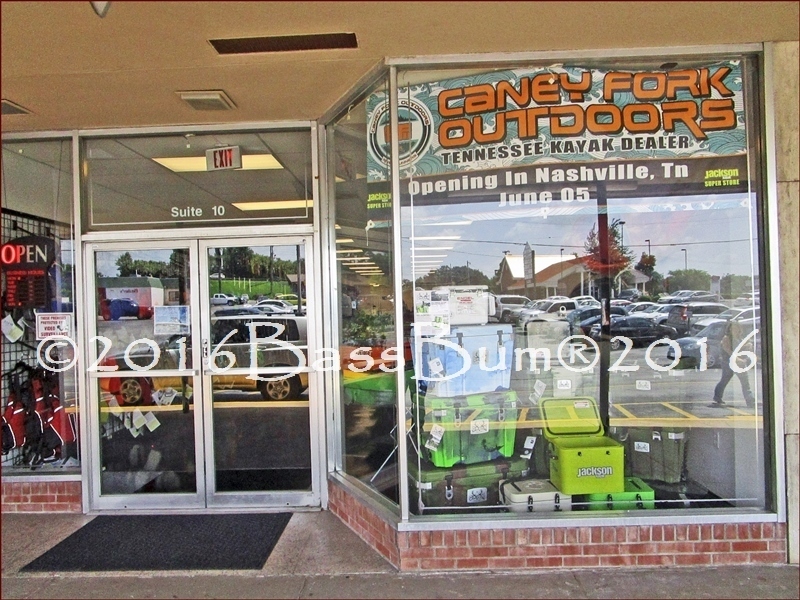 If you’re in Nashville and are looking for a kayak or already have one, be sure and check out Caney Fork Outdoors. The owners, Ryan and Joel Martin are great guys. Knowledgeable and helpful. You can find them at 2710 Old Lebanon Road, Suite 10, in Nashville.